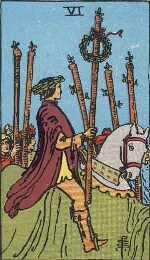 The Six of Wands or the Lord of Victory card stands for fight, struggle and competition leading to eventual victory. It applies to all those areas of our life that involve struggle for the achievement of our goals. The goals may be both spiritual and temporal. The Six of the Suit of Wands means that there will be some success through your hard work and can sometimes represent the nearness of important news or new happenings. Sometimes we have to undergo tough training courses not only in material fields but also in areas of self-management or spiritual development. Victory cannot be achieved in any field without putting in sustained and strenuous efforts. This card appears mostly when the subject has been striving hard against frustrating odds because of unhelpful influences. He feels confused and lost in course of his struggle to achieve his dreams, ambitions or goals. The card also indicates the course of action that will lead to success and happiness.